1900 Davenport Road. 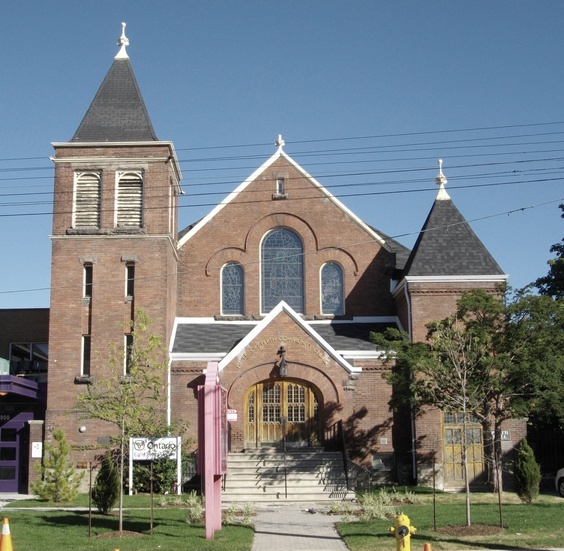 Davenport -Perth Neighbourhood Centre. Long shot, front entrance. Photographer John Huzil. James Ellis was commissioned to prepare plans to enlarge the church circa 1900. Ellis incorporated the east wall of the existing building into his design, the rest was demolished. The new building “was square in plan with a cross-vaulted ceiling of wood trusses on iron columns.” It accommodated more than 400 people. 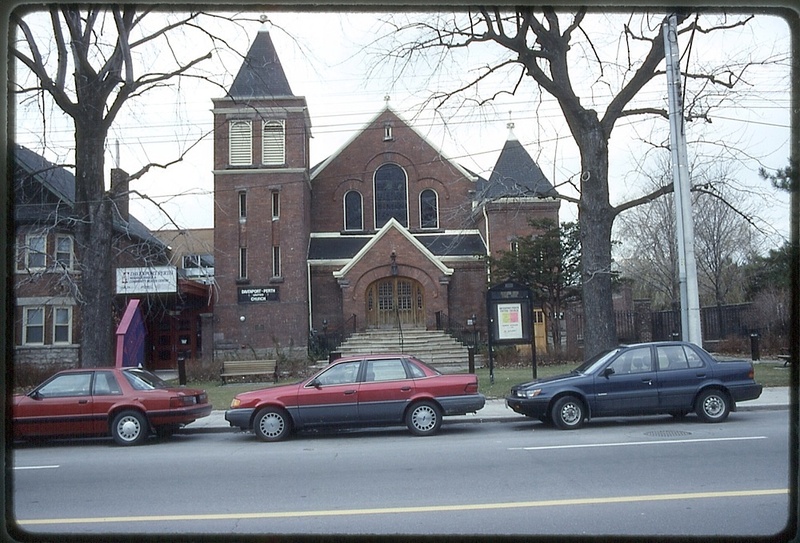 The building underwent later extension in 1912 to accommodate a pipe organ in the rear and in 1913 the cemetery was transformed into an ice rink. In 1938 the Memorial Gardens were created nest to the original east wall. 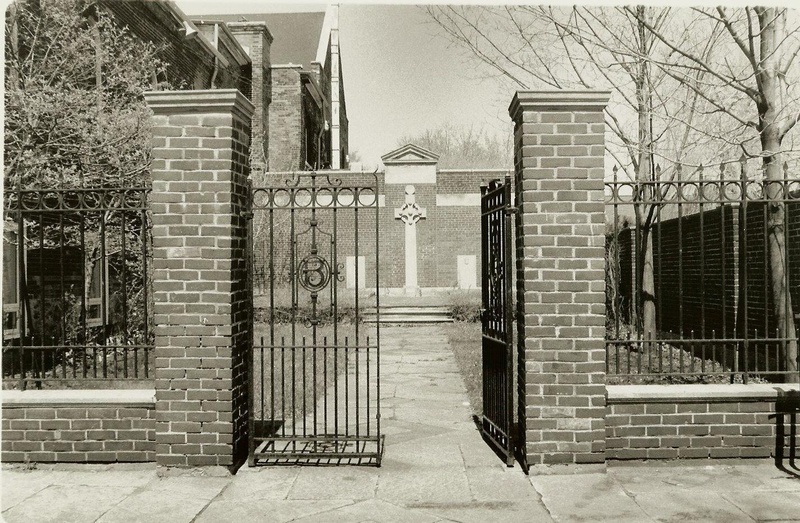 Gates to Bull Family Memorial Garden at Davenport United Church, now Davenport-Perth Community Centre, affectionately known as the “bull pen” to the congregation of the church. Monument to Maria Scott Brennen Bull. Photographer Deborah Cox. Source Deborah Cox. Dominant visual features are the grand entrance steps leading to a wide flattened romanesque (almost tudor in style) arched main doorway, and the 2 towers flanking the front facade. The main entrance leads to a vestibule which provides a transition space between the exterior and the sanctuary. The vestibule roof is kept low so as to not obstruct the main sanctuary’s grand romanesque arched windows, which at night would act as a beacon to the faithful. The windows reflect a typical Christian theme of three windows grouped together, making manifest the Holy Trinity. The tallest tower is the traditional campanile or bell tower, made plain by the louvred openings at the top. The tall narrow windows combined with the parapet wall at the roof give the tower a martial feel. The second tower, completes the framing of the entrance and provides street access to the basement level public rooms. The doorway has clerestorey lights over the pair of doors, underneath a massive rough-hewn stone lintel (which makes the connection to the fact that this entrance leads down to the lower level and differentiates it from the main entrance).